According to Chinese astrology compatibility, these two zodiac signs of the tiger and the monkey have opposite personalities. The tiger and monkey relationship will be full of joy. They might be immediately attracted to each other. They both love to have fun and are typically optimistic. However, they will have arguments. They might have issues agreeing on anything. The tiger and monkey relationship might not be a happy one. They might not find each other impressive in love. The tiger will want to be the dominant one in the relationship. Because of this, they might compete with each other. They both like to spend money, are friendly, and lively. They both are smart and confident. The tiger might see the monkey as being frivolous and even careless. When the tiger is dating the monkey, they go after their own interests. They will have different outlooks. The tiger has a magnetic personality and a lot of confidence. They have individuality and are independent. They will want to be in control and will not let their partner take that. The tiger male and tiger female have a sense of nobility. They can be domineering and motivated. They do not like clingy or controlling partners. They will want to keep their freedom. They can be egotistical when trying to get their way. The monkey will appreciate their partner’s temperament. They like to show off, especially to their friends. Eventually, they might compete with their lover for the spotlight. They might compete for control in the relationship. They are mischievous and fun loving. The monkey male and monkey female have a lot of curiosity and are very outgoing. They will go after what makes them happy. They will understand when the independent tiger needs alone time. The Monkeys can be somewhat sensitive and might feel as if they are not being appreciated. They can be shrewd. They are independent but like to have fun. Because of this, the tiger will feel they are the only one working at the Tiger Monkey relationship. The tiger and the monkey in love both might always have doubts about each other. Because of this,they both might keep secrets from each other ultimately leading to a breakup of the Tiger and Monkey love match. A tiger wife and monkey husband might have too many disagreements to be successful. The tiger woman and monkey man will not be sexually compatible in bed. A tiger husband and monkey wife might work well together. The monkey woman has a sense of humor that will help any tense situations they have. She will enjoy having a lot of friends. The tiger man will spend more time with their lover. The tiger and the monkey friendship will work well together in business but not romance. They will not have trouble keeping their true natures. However, they might have problems forming a bond. In a tiger and the monkey marriage if they can compromise, they can have a successful relationship. If the tiger and the monkey want the relationship to be successful, one will have to control the other. If the tiger and monkey soulmates can agree, they can avoid a power struggle and improve their love compatibility. They can have a lot of fun together. However, both will have to be careful about having disagreements. 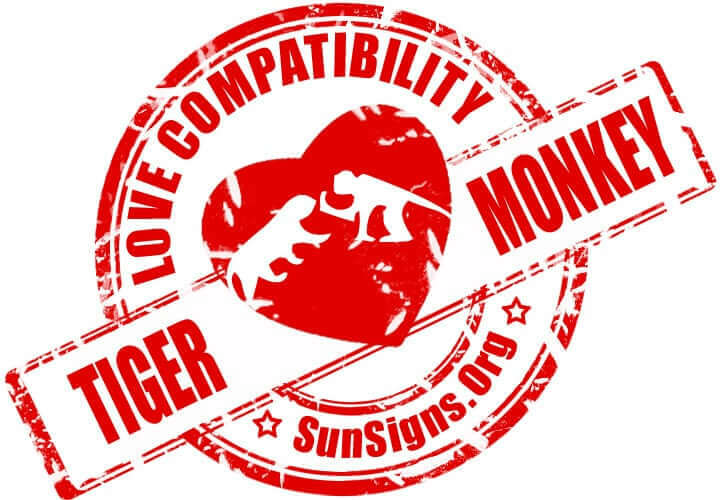 Tiger & Monkey Chinese Horoscope Compatibility Rated 1 Hearts!